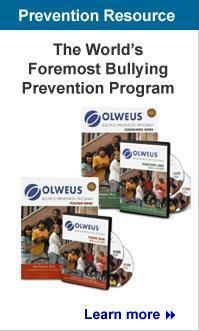 This year HAFTR Middle School implemented the Olweus Bully Prevention Program. Last year, the HAFTR Olweus Bully Prevention Coordinating Committee, composed of administrators, support staff, teachers, and parents underwent an intensive two day workshop given by a certified Olweus trainer. The TC Ticker reports that Traverse City Area Public Schools (TCAPS) has settled on an anti-bullying modus operandi for grades K-12: the Olweus Bullying Prevention Program (OBPP). Bishop Baumgartner Memorial Catholic School kicked off the Olweus Bullying Prevention Program campaign yesterday. PENDLETON — Anderson School District 4 board members were told Monday that a bullying program introduced last year yielded strong improvements at Pendleton High School. The Pennsylvania Department of Education (PDE), Office of Safe Schools is committed to supporting statewide bullying prevention efforts to help create and maintain safe and secure learning environments. To build on the foundation of over one decade of research-based bullying prevention program implementation, PDE is increasing training opportunities for the Olweus Bullying Prevention Program (OBPP). On September 28th, Delsea Regional High School held an assembly to introduce its students to the new Olweus Bullying Prevention Program. Mora and Ogilvie schools are taking a proactive approach to reduce bullying in schools as they take part in the Olweus Bullying Prevention Program for the first time. Dodge Intermediate School is joining the ranks of schools across the nation to install a bullying prevention program in its classes. The students and teachers at Burton Elementary are continuing with their implementation of the Olweus Program this year. Every public school in Jamestown has some type of policy in place to combat bullying, some a lot more than others. The topic of bullying seems to be on everyone’s lips these days. Back to school: What if your child is bullied? Carolyn Carr Latady, family support advocate for the Forest Lake School District, offered the following tips for parents. MARTINSBURG - The fourth-graders at Orchard View Intermediate School were geared up to fight bullying Wednesday afternoon as they rallied together in the school gym to chant the program's four rules and celebrate Berkeley County Schools' adoption of the OLWEUS program. What is Olweus at SHS? Olweus is an internationally renowned anti-bullying program that is currently being implemented in numerous states within the U.S.
At the onset of the 2011-2012 school year, Cedarbrook secured a grant to adopt the nationally-recognized Olweus Bullying Prevention Program. It is very important to the Bear Creek community that everyone feels safe and have a positive learning experience. The goal of the Olweus Bullying Prevention program is to reduce existing bullying problems and to prevent the development of new ones (Olweus, 1993). Forest Lake School District officials say a K-9 program instituted six years ago to address bullying in the schools has had positive results. The Cheyenne Police Department and Laramie County School District #1 will host a spe-cial Bullying Prevention 2012 kickoff event this Saturday, August 25th, from 1-4 pm at the Lions Park Amphitheater.